The olfactory receptors register memories in a better and customized manner. A particular smell exudes a long-lost memory resting somewhere deep inside the mind. I’ve experienced it a number of times. Like the flickering of a bulb, the memories have come to take me away with them….to some lonesome afternoon or sometimes a cheerful visage makes my heart happy as it resurfaces from the days of the childhood. Last week, I visited a friend’s house, a small one-storey one situated a little far away from the humdrum of the city. It was a great afternoon spent sitting in the cozy armchair with a cup of tea and homemade delicious onion fritters. A vast stretch of the sky was visible from the balcony at the backside of the house we were seated, two frangipani trees were cradling the cerulean beauty. The trees were blooming with flowers and the occasional whiff resuscitated my memories of days long past. Summer vacation was that time of the year when I was supposed to spend a few days like a free bird with no strings attached. That is, no regular study, no mandatory maths during the afternoon, and to top it all, no constant supervising by maa. Yes, summer vacation meant visiting my maternal grandfather’s house with happiness and independence galore. There was a small garden in front of the house and, that was my very own heaven. I used to observe the beetles climbing up the stems, gossamer web of spiders reflecting rainbows when were kissed by sunlight and, the unknown, unrecognised, beauty of tiny wildflowers. My favourite spot in the whole garden was under a big frangipani tree. I had spent long summer afternoons with a book and a bowl of sliced raw mangoes sitting under that tree. That tree knew many a secret of a teenage girl…her joy and pain. That tree was aware of her first crush, Feluda, the super sleuth of Satyajit Ray. And, the smell. 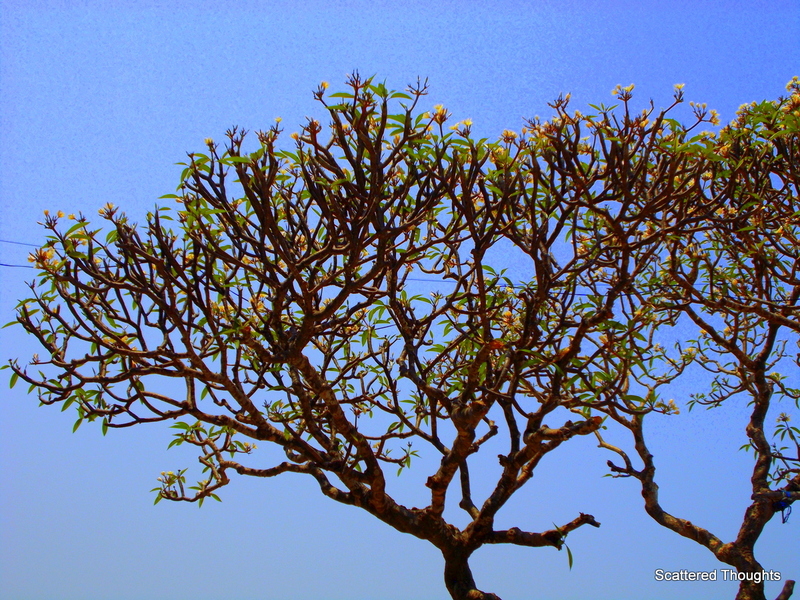 The intoxicating smell of frangipani…. mellow, mellifluous, mature. That day at my friend’s place transported me under that tree. Unknowingly, I stopped talking as I kept staring at the flowery branches. She asked me about the abrupt silence. A mild jerk and I were back to the present. I nodded and smiled as to assure her. Some memories, some moments, can be cherished only with your own self. Once shared, the enchantment is lost. Those childhood trinkets, let it be. Deliciously evocative, and such eloquence too! Many congratulations on your writing; it is excellent. Sorry about that, though I just clicked my name in my comment above and all worked perfectly well. Anyway, all best wishes, Hariod. Beautiful read Maniparna, and as usual lovely pics by you! A subtle Topic so well narrated.. Thanks for sharing, Maniparna! A beautiful ode to your memories Maniparna–i loved it. For me it is ‘raat ki raani’ which takes me back to my first home.Some connections are unbreakable. So great that we can experience heaven on earth! Yes – I think I can smell the frangipani now 🙂 My favourite flower fragrance. Some memories must be protected and kept safe in our minds and hearts. Others, as you shared here, can bring us blessings of helping us to remember our own special trees, fruits, flowers and first childhood “crushes,” Maniparna. Oh I love this tree maniparna right from the time I didn’t know it’s name. The smell of the flower is so subtle and the tree looks so elegant .. Yes.. and I am sure you know it does not take long or much to take me back..
captivating writing. something that touches the senses can activate those nostalgic memories. as if you could reach out and touch them. So deeply evocative, what with the frangipani flowers, raw mangoes and balmy afternoons, that it stirred a nest of memories within, of school vacations gallivanting around vast tracts of palm fringed terrain studded with a variety of trees and ponds, of days spent in climbing trees, swimming in the ponds and relishing mangoes, jackfruits and sapodillas. Fifty years down the line, those ancestral properties have undergone radical transformations having passed on to outside interests. But the memories remain, leaping out like jack-in-the-box at the slightest touch, yours in this case…best wishes. I have written much about these friends who are always ready to welcome us into their clasping arms. Aspirations and goals to cheer…. So, beautifully written Maniparna, I was swayed by the flow of the narration. Indeed it is nostalgic and we all go through these bouts of recollection and reflection of good old days, the full freedom and the entire time at your disposal, especially the summer holidays. Most of us would have visited either the paternal or maternal side, the village or a small town where the life had its pace and the place had those rustic charm. This is a beautiful feeling which cannot shared with all and everything we experience also cannot be fully shared, there are secrets and there are special moments which we preserve for ourselves only. We do talk to ourselves, and it could be anything and some may appear very silly today and some are so profound we may question how matured we were those days, was it me? Yes, the tree, the flowers, the smell, the place, the whiff of breeze, the balcony wide open to the open sky, childhood memories and I liked the way you have put the “secrets of teenage girl…the joy and the pain”, we all have our little secrets and these always remain with us. Thanks for taking your time to read the book. Always a pleasure to receive your views and reviews. Right you are, Andy 🙂 they are the silent listeners…. 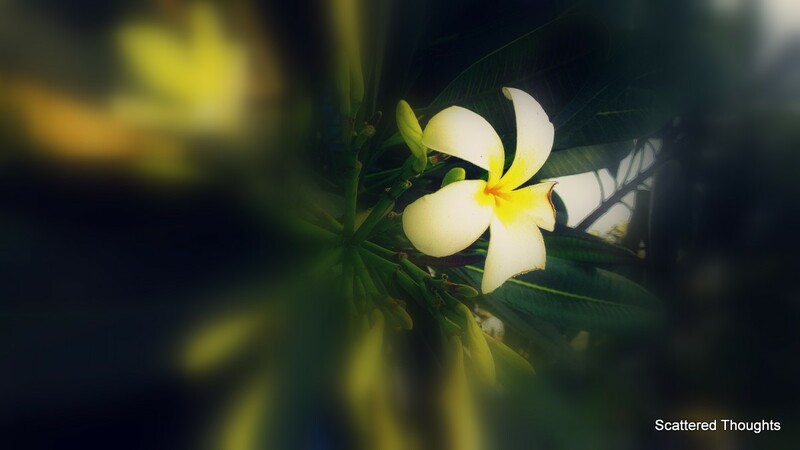 I just love the divine smell of frangipani flowers!